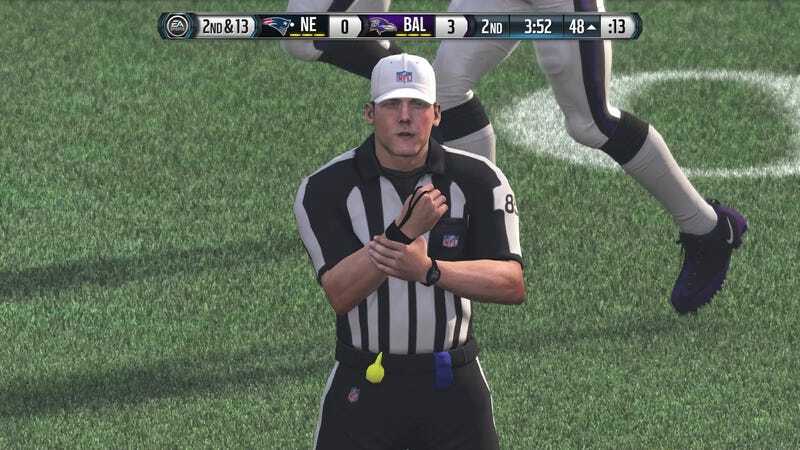 Even the AI refs in Madden need glasses. Over the weekend, at the FIFA Interactive World Cup, a questionable offsides started to make me wonder: What if the refs in video games are programmed to, on occasion, get it wrong? In Madden, for example, there’s a “challenge” system that mirrors NFL football. If you think a referee made a mistake, you can challenge their call and, if you’re proven right, they’ll reverse it. Surely the game must have some level of human error to allow for this system to work, no? A search brings up a Quora post from 2015 where a former EA employee describes a “referee strictness” bar on calls like holding, and looking back over YouTube highlights, there’s a good few examples of interesting interpretation from the refs. We reached out to Electronic Arts about the AI referee’s officiating and the company confirmed that yes, there is a degree of “human error” built into Madden. Though referees will follow NFL rules, reviewing any scoring play or calls inside the final two minutes of each half, other situations may arise where a wrong call can be made. Very specific circumstances, like fumbles or sideline catches, may prompt a ref to get a call wrong in order to prompt a potential coach’s challenge. Electronic Arts also noted that this human error will not occur in the game’s Competitive play, the default mode for online games and tournaments. In any sport, there’s always a good case of a referee getting it wrong. But in the virtual world, referees would theoretically make perfect calls every time—they’re operating inside a system, where 1's and 0's can solve the problems created by human perception. Though playing virtual football would sidestep many of the pitfalls of real-life sports officiating, it follows that if you want a realistic simulation of game day, there needs to be a blown call at some point.